Fairmont, Swissotel and Raffles Hotels & Resorts are three distict brands that fall under the banner of AccorHotels, a multi-national, multi-brand hospitality company. On July 2, 2018, the loyalty programs offered by these three brands—Fairmont President’s Club, Swissôtel Circle and Raffles Ambassadors—merged with Le Club AccorHotels’ (LCAH) global loyalty program. The challenge we faced post integration was a lack of familiarity about the LCAH program in the North American market. We needed to create awareness and interest among both current and prospective members. And we needed to do this in a way that would distinguish LCAH from other loyalty programs while cutting through crowded digital platforms and making potential guests stop, watch and click. 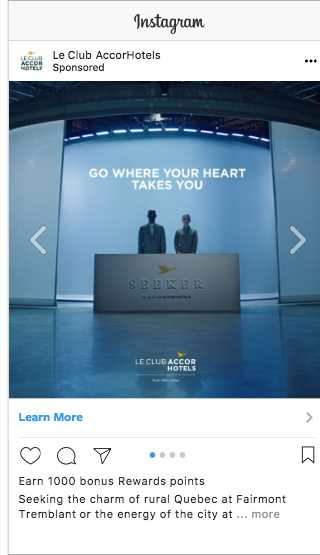 To tackle this challenge, we developed Seeker, a never-done-before interactive experience that uses biometrics to show that, for Le Club AccorHotels, luxury and loyalty is all about knowing what guests want even before they do. 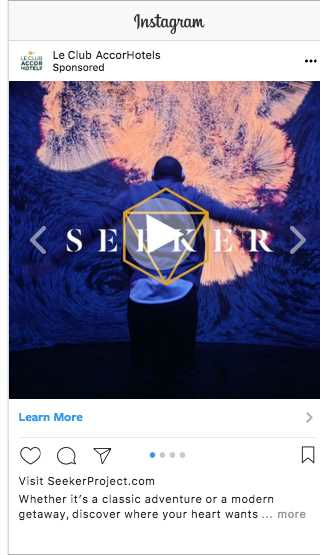 At the heart of the campaign was Seeker, a pop-up, interactive installation that measured biometric responses to immersive travel-related stimuli to arrive at a ‘taste palette’ of destinations that our participants intuitively wanted to visit. In an all-encompassing, custom-designed environment with back-projected LED walls, people were shown a vibrant montage of destinations, travel experiences, sights and sounds from around the world. During this, biometric measurements (EEG, pulse oximeter, galvanic skin response, etc.) were recorded to glean, not just where, but why they wanted to travel. There was also an online version of Seeker—a standalone microsite based on the Harvard bias test with data points extrapolated from mouse movement, speed-to-decision and facial recognition. Upon completion, participants received a digital folio, complete with a data-art ‘psychograph’ of destinations that resonated with them on a primal level and relevant Accor property recommendations. Our hypothesis was that people are often driven to choose travel destinations through a mostly rational process. But that doesn’t necessarily reflect where they truly want to go. Through Seeker, we sought to know our guests better than they know themselves—and show them where their ‘hearts’ wanted to go next. The campaign was fully integrated with an array of strategic tactics, including: dynamic video, OOH billboards, programmatic digital banners, POS digital displays, targeted emails, social and influencer content, paid search, multiple landing pages and hotel collateral, including key cards, elevator posters and amenity cards. We also offered LCAH members 1000 loyalty points for participating. Our message was extremely well received. Within the first day alone, before we had any paid advertising in-market, we generated over 9.5 million earned-media impressions from the travel industry, domestic and international press, loyalty blogs and technology reporters. The Seeker campaign was a massive success. Not only did we spark awareness around the LCAH loyalty program, we also captured the hearts and minds of members and non-members alike, and converted that awareness into new enrollments, sales and revenue growth. Here are the key results as of August 2018: •	+100 Million Media Impressions, on track to achieve +150 million impressions •	7% Year-over-Year Revenue Growth (projected), exceeding our goal by 2% •	5% Year-over-Year Enrollment Growth (projected), exceeding our goal by 2% •	99.9% Retention of Existing Member Base (despite the loyalty migration) •	And a Return on Investment (ROI) of 125:1 The campaign also received widespread international acclaim in publications around the world, including but not limited to: AFAR Magazine Fast Company, Inc. Magazine, Skift, Les Affaires, The Daily Mail and Travel Weekly.